Delta offers full gear box design, manufacturing and re-manufacturing services. Whether you have a set of drawing or not, our team is prepared to reverse engineer or re-engineer and manufacture gear boxes for large custom application. 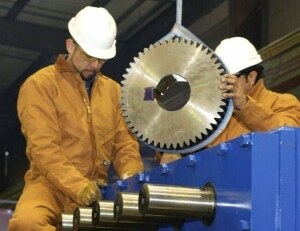 When you’re in need of industrial gearbox repair Delta experienced engineering teams are readily accessible to work with you to get your gearbox up and running in the shortest possible time. Repairing an existing gearbox to a “like new” can cost 40% less than a replacement unit and can reduce delivery time significantly. 50+ years of gear engineering enables us to deliver proven gearbox repair for common gearbox brands, such as Flender, Hansen, Lufkin, Falk and SEW as well as less common models including Hico, Brevini, Shanthi Gears, Fenner, Renold and any other name brand.